Do We Need More Malls? Yup! I choose to post the picture exactly at this position. I want you to start see your life and the world from different perspectives. When everything is energy, everything is in motion. Motions comes with patterns and cycle. Everything that we know in this modern life has its cycle and patterns. What is happening to America’s malls, happens to Malaysia’s malls. And yet, we don’t take the pattern seriously. Being human we hope that things (economy, lifestyle etc) get better and stay the same (funny isn’t it?!). Cycle of economic will get better but don’t expect solid growing in structures as the economic energy is moving in different directions. Photo taken from Time magazine dated 31st July 2017. Sometimes it seems like Life hit us hard. But the Truth is beyond what we see. Look at how the raindrops hit the flower again and again. It seems hard, but if we observe this dance, we see each drop hits the flower gracefully. The flower did not break, and the raindrops did not die. Everything flow and dance on its steps. And this is how the rains and flowers dance together. Know our steps and uniqueness. And when Life asks us to dance, we shall do it beautifully! Note: I recorded the video in slow motion, but I’m not sure if the video will be played in slow motion. I hope it does. Vlog #3 – Lesson from a Bird. 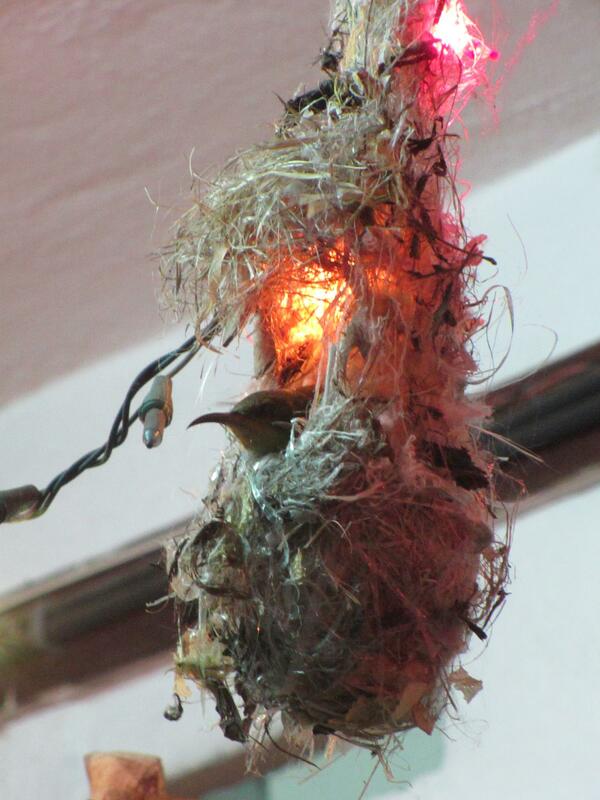 I truly love this bird – Olive Backed Sunbird. I loved to feel them and used to play with them too. Whenever they sat on the plastic rope, I will gently touch the other end and shake the rope a little, just to feel their energy. Then I would say, “I feel you!”. They have tiny energy field but very active and strong. Here’s what I learned from them. I don’t usually say this but if you like the video, do subscribe the channel “Quantum Love” and share it with others. Here’s my Vlog #2 and it’s about the different between Respond and React in energetic motion. You might want to check it out how we screw up especially when it comes to reacting. Happy watching! and if you enjoy the video, I invite you to subscribe the channel – Quantum Love. We are so caught in the unconscious patterns in searching the self-identification through materialism. We search the world of love and peacefulness through physical treasures like body slimming, fancy cloths, expensive cars and more money. And along the journey to this quest, we become more lack than we first started. Why is that? 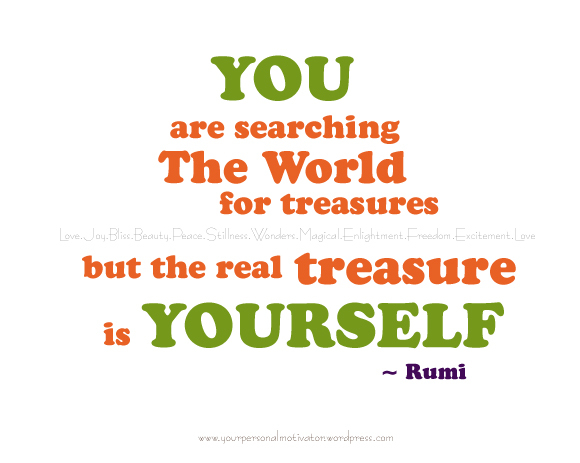 The answer is we have lost connection with our true treasure, the SELF within. We spend time focusing on external worlds and treasures and we forget what matters the most is ourselves; the soul that lives in this physical body, the perfect body and health we have, the balance emotions and the powerful mind. Today, you can start spending 10 minutes on this activity; change your focus from the external world (from money, relationships with others, problems, illness) to your inner world. Only 10 minutes as a start and let us start with one part of the body. 2. Breathe, inhale and exhale deeply. 3. Focus only on your breath for a moment. 4. Feels the energy living inside you. Feel your hands from within. 5. Acknowledge the hands that feed food into your mouth, the hands that heal others through touches. Feels it but not thinking about it. 6. Feels the love you have between YOU and these hands. 7. Bring these hands to your heart center. 8. Say ‘Thank you for being part of me. I love you’. This activity can help you connect with your world from within through your physical body. The physical body is known as the door into our inner world. This simple activity can be done in the office or anywhere you like it. You can do the same activity again tomorrow and you may choose another part of the body like your feet, your eyes, your brain and so forth. You can skip step 7 or use visualization when you connect love between the body parts and your heart. The more you practice, the more deeper you connect with your true treasure – YOURSELF! Crow, a common black bird on this beautiful Earth. The appearance of this bird always misunderstood by many people. Manipulated in the movies, many people tend to believe that whenever crows is nearby, dark forces is nearby too. Whether this is true or otherwise, crows are unique on its own. In the spirituality of Native America, Crows represent justice, spiritual strengths and more. And there is another kind of more. On one fine morning, when I was reading a book, I’ve got visited by a crow. Her appearance was obvious, near and loud. I put down my book and observe this unique creature. In less than a minute, she has already taught me something beautiful about life. 1. When the world mentally labeled that white is clean and pure, whereas black is dirty and dark, crows don’t care about these labels. They simply didn’t get identify with it. They accept the way they are and live the life by being themselves. Lesson: Acceptance and detachment. When you accept yourself and detach from labels made by the mind, you get to connect with your true-self. And it is easier to be your true self without any mind label identification. 2. Have you seen any crow hidden behind the tree because she’s not as colorful as other birds? 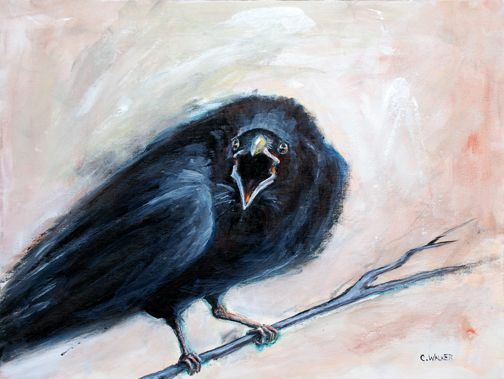 Have you seen any crow that feels so shy and hide her loud voice? Crows are one of the birds that appear in front of you with high self-esteem. One of the evidence is their appearance rather louder than silence. What are they telling us about self-esteem? Lesson: Be loud and be bold about yourselves. Even if you feel that you are lack compare to others, even if you feel less pretty compare to others and many more of lack, accept it because it will help you increase your self-esteem. Accept whoever you are because acceptance is beautiful life in making. Never hide yourself. Face the world with all the self-esteem you have. Throughout the time, it will increase and become stronger inside you. And always be proud of yourself! Expose your talents, your skills, your voice, your opinions, your knowledge about life from the world. Do it with kindness and love. What the world need right now is people who can fit the puzzle of life correctly by being themselves. Remember this; when the crows not trying to be others, it gives a sense of beauty in the world of birds. The world has colorful birds and also just one color bird; the black crow. This is not sacrifice. This is the acceptance of being. And YOU are unique. We are unique. Only by being yourself, you are helping others being theirs. All of it will fit the puzzle of life beautifully. Only human living in hurry. We get hurry to work, to eat, when we are driving, making decisions, talking, pass judgement toward self and others..and yet we wonder where is love in life? 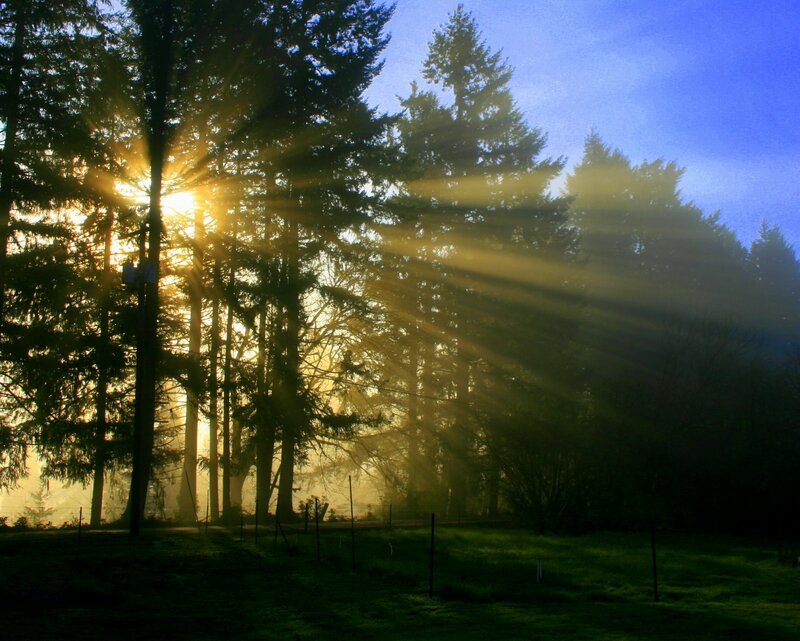 Why are we have not been given miracle and healing in life? Ever ponder why life passes by so slow and yet we miss it? 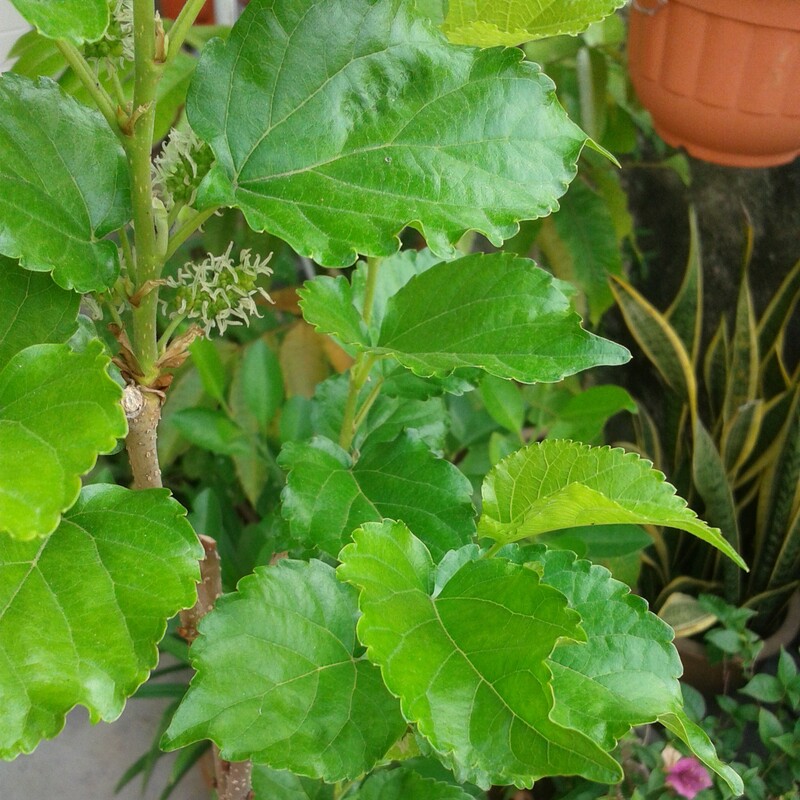 I’ve learned from these mulberries in my garden. They take weeks to grow as it is. They breathe in harmony and yet they grow on productivity. 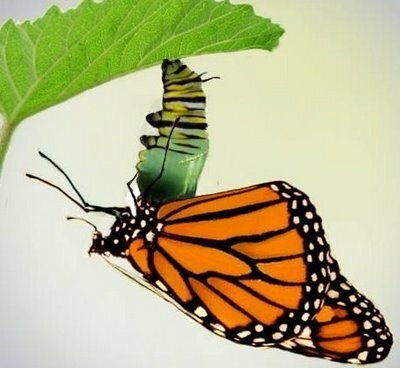 Their moments of transformation are beautiful. Let’s take life slowly today and yet live in productivity by achieve something better than yesterday. Good morning beautiful souls. Few days ago I sat in front of beautiful plants. The plants have tiny purple flowers. I remember that I bought these plants in 2010 because I like the tiny purple flowers. As I starred at the plants I saw 3 caterpillars were eating up the tiny leaves. These caterpillars were in metamorphosis (transition) period from caterpillars to butterfly. Nearly 98% of the body were covered in protective shell and only the head still uncovered. As I looked at these three caterpillar, I saw one of them slide inside the shell slowly and closed the cover that entirely wrapped its head too. The caterpillar seems like stitching the shell and seconds later, it was completely closed. Silent. Nothing was around except its patience…patience in waiting for another beautiful life to be born. A moment alone. A moment of must. A moment of nature. A moment of growth. Transformation between the life, death and living. and death to a life. All you can do is spend 30 to 60 minutes in silent every night and do this transmutation of energies. It can be done through meditation, self-reflection moment or self-healing. It is to transform your life from wherever you were into something better and from nothing to accomplishment of lessons. 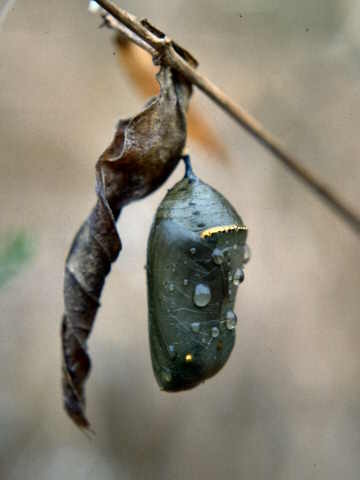 The caterpillar exists to teach us the beauty of transformation. It is up to us to see it as life priceless lesson or just see them as another creature that exists just to fancy the world. Credit to Conscious Travel for the quote.